Click here for our free and confidential assessment tools. The larger our community, the more businesses will listen. Did you know that focusing on people is good for business? Not only does extensive research prove that companies that put people first are more profitable than competitors, but the 42 companies in the Engaged Company Stock Index have outperformed the S&P 500 by 25.6 percentage point in the 4 ½ year since it was created. 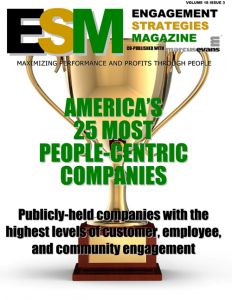 Top 25 Most People-Centric publicly held companies in the U.S. These 25 firms surpass all others when it comes to strategically engaging their employees, customers and communities based on an independent analysis of over 400 U.S. publicly held companies. These are the Top 25 Most People-Centric publicly held companies in the U.S. in 2017, based on a detailed analysis of independent research by McBassi & Company, a leading human capital analytics firm. People-Centric companies seek to achieve their financial and other goals by strategically engaging their employees, customers and communities. No company is perfect and engagement is relative: These companies are judged to be not only the best companies to work for, but also the best to do business with as a customer or community member. Click here to learn about the methodology. Please tell us your thoughts about these companies or recommend other great companies on Facebook or Linked in. People-centric businesses profit through people instead of from them. By fostering the proactive involvement of all the people critical to an organization’s success — customers, employees, distribution partners, suppliers, communities, etc. – and by consistently acting with integrity by delivering their promises, these people-focused outperform their competitors and create a more prosperous, engaged society. People-Centric Enterprise is a new approach to business based on extensive research that conclusively proves that companies successfully engaging all of their customers, employees, business partners and communities outperform others over the mid- to long term. Many companies bring their own approaches to People-Centric Enterprise, but one element they share: they all are founded on the premise that people are an organization’s No. 1 asset. There are many companies that practice People-Centric Enterprise without calling it that – Costco, Whole Foods, the Container Store and many of the companies on the Great Companies to Work For lists that are now popular in almost every state. We believe it’s time to give this philosophy a name. 1. Focus on creating sustainable, long-term profitability and return for shareholders based on having loyal customers, distribution partners, employees, vendors and communities. They fundamentally value their people and continually seek out new ways to “wow” customers and attract talent and partners. 2. Share a clear sense of mission of what the organization stands for in terms of its brand and culture, as well as a commitment to keeping promises. They strategically focus on achieving goals by fostering the proactive involvement of everyone critical to success, and they demonstrate integrity by consistently keeping their promises to all of their constituencies. 3. Establish clear goals shared with their community. There’s a general understanding of where the organization is headed and how its community contributes and benefits, building a brand that unites all of their people with a common understanding of the value proposition and promises. 4. Create an emotional bond between customers, distribution partners, employees, vendors and other constituencies; they foster relationships by continually listening, communicating and enabling people to play and celebrate success with their significant others. 5. Continually communicate to all of their constituencies; they utilize the appropriate combination of permission-based communications to inform, not just sell, so that everyone has a maximum understanding of how they can help and/or benefit the organization. 6. Invest in capability, continually working to make sure everyone is able to do what’s asked of them through effective learning strategies. 7. Provide support for all of their communities. Customers, distribution partners, employees, vendors and communities feel valued, because they are. This can’t be faked. 8. Inspire collaboration and innovation so everyone in every community is inspired to look out for new ideas, opportunities, new products or ways to improve service or cut costs. 9. Honor the importance of very task – even entry-level people or others with tough jobs feel a sense of task value, because they understand how doing even so-called “menial” jobs well is critical to a smooth-functioning, profitable organization. 10. Support their communities. These organizations understand that one way to inspire people, have fun and create an emotional bond is to bring people together to work on a cause that helps people – the most natural form of team-building. 11. Monitor and measure results and track engagement to make sure that managers are fostering positive workplaces and customer experiences, and that people are able and willing to do what is asked of them. 12. Provide Feedback – they foster two-way communication to uncover ways to improve or address problems. People-focused organizations are better to do business with and more gratifying to work for. How “good” is your company? How does your organization’s engagement practices benchmark against best practices and other companies? There are numerous ways to benefit from and get involved with the nascent People-Centric Enterprise movement. The larger our community, the more businesses will listen. Purchase the textbook—If you are a business executive, learn how to implement People-Centric Enterprise through Enterprise Engagement: The Textbook. The new book is available online individually or in bulk for your use by your team or distribution to clients. It’s your road map to profiting from this new business philosophy and implementation strategy. Become a supporter of the Enterprise Engagement Alliance—This option is for businesses that wish to demonstrate the commitment of their organizations to people and to help fund outreach and education efforts. There are multiple educational and marketing benefits. Membership includes one or more copies of Enterprise Engagement: The Textbook based on the level of membership you select. Get certified in Enterprise Engagement—This is for business people interested in demonstrating their expertise in this new area of business. Prepare for the Enterprise Engagement certification and take a test to receive a basic certification. You can prepare for the online test by purchasing Enterprise Engagement: The Textbook or by accessing online preparation courses at no charge at Engagement University Online. There is no cost to access online education or to take the test. You only pay if you wish to formally activate your certification, which includes a one-year membership in the Enterprise Engagement Alliance. Keep up to date—Subscribe to the Enterprise Engagement Alliance’s online and e-mail media about best practices and news related to all aspects of this field. Become a sponsor—leading corporations are contributing to this effort by sponsoring the development of curriculum and research that can be used to improve the results of engagement efforts. For additional information, contact Bruce Bolger at bolger@theeea.org; 914-591-7600, ext. 230. The Enterprise Engagement Alliance is comprised of business people and academics who believe that this is a better approach to business from which almost all organizations can benefit, including their own. The EEA created a formal definition, framework and implementation process for an enterprise approach to engaging people that it both gives away at Engagementuonline.com (updated version coming soon), and sells through Enterprise Engagement: The Textbook for $36 for those who wish to support the EEA (or for a little less at Amazon.com), as well and other training and consulting services. Go to TheEEA.org for complete information about the Enterprise Engagement Alliance. Contact Us, Tell Us About Great Companies or Just Drop Us a Line! Please feel free to make suggestions or share information about people-centric organizations and leaders you know on our Facebook, Linked in, or Twitter communities. If you do not belong to any of these, or you wish to communicate with us directly, please use this contact us form. to learn more about the Enterprise Engagement Alliance.